For other uses, see Fort York (disambiguation). Fort York is a historic site of military fortifications and related buildings located in the Fort York neighbourhood, west of downtown Toronto, Ontario, Canada. The fort was built by the British Army and Canadian militia troops in the late 18th and early 19th centuries, to defend the settlement and the new capital of the Upper Canada region from the threat of a military attack, principally from the newly independent United States. It was designated a National Historic Site in 1923. The City of Toronto designated the site, along with the nearby Fort York Armoury, as a Heritage Conservation District in 1985. Fort York in 1804. The Fort was built just west of the mouth of Garrison Creek on the north western shore of Lake Ontario. In 1793, Lieutenant Governor John Graves Simcoe authorized a garrison on the present site of Fort York, just west of the mouth of Garrison Creek on the north western shore of Lake Ontario. Simcoe recognized Toronto was an ideal site for settlement and defence because of its natural harbour and relative longer distance from the United States. Fort York guards the western (at the time of construction, the only) entrance to the bay. Simcoe had decided to make Toronto (which he renamed York) the capital of Upper Canada, and the government, the first parliament buildings and the town were established one and a half miles east of the fort (near the foot of the present Parliament Street). During the War of 1812, in the Battle of York, on 27 April 1813, U.S. army and naval forces attacked York from Lake Ontario, overrunning the garrison. As the British abandoned the fort, they set the powder magazine to blow up, killing or wounding several hundred U.S. soldiers (including General Zebulon Pike, for whom Pikes Peak is named). The U.S. destroyed what was left of the garrison and burned much of the settlement of York, including the Parliament Buildings during their five-day occupation. They had defeated outnumbered British, Canadian, and First Nations forces, but with the loss of many more men. Following several more U.S. raids over the summer, the British garrison returned to York and rebuilt the fortifications, most of which are still standing today. The rebuilt fort was sufficient to repel a further attempted invasion in 1814. The American naval squadron and Fort York exchange fire during the Battle of York on 27 April 1813. The British Army had occupied Fort York from 1793 but transferred the site to the Government of Canada in 1869, shortly after Canadian Confederation. The Department of Militia and Defence continued to use the site as a military establishment until 1880, and again during the First and Second World Wars. The site was threatened in 1905 by a proposed streetcar route to the CNE, which would have divided the fort property in two. Following an outcry, the line was not built through the fort. Later in 1909, the Department of Militia and Defence later transferred the property to the City of Toronto with the provision that the city would preserve the Fort's historic structures. On 25 May 1923, the Fort was established as a National Historic Site of Canada. The city undertook restoration work and the Fort was opened to the public in 1934. Cannon emplacements at the Fort. Built along the original waterfront of Toronto, the Fort is presently situated inland due to land reclamation projects to the south. In the 1950s, Fort York was again threatened by planned construction of the Gardiner Expressway, but highway planners rerouted the elevated highway to the south of the grounds. On June 28, 1985, Canada Post issued a stamp to Fort York, one of 20 in the "Forts Across Canada Series" (1983 & 1985). From 1995 to 2008, Fort York hosted Toronto's annual Festival of Beer. Fort York hosted the wheelchair archery events for the 2017 Invictus Games. The reclaimed lands to the south of the fort have been developed, with new condo towers limiting reconnection with Lake Ontario. However, pedestrian and cycling bridges are under construction (2017) to connect the Garrison Common, at the western end of the National Historic Site, with parks and neighborhoods to the north and south. Fort York in 1832. It was used by the British Army until 1869, when it was transferred to the Government of Canada. Fort York in 1909. The Fort saw military use from the Canadian militia until the 1880s. View of the Brick Magazine and Blockhouse 1, two buildings inside the Fort. In 1797 a garrison was built east of modern-day Bathurst Street, on the east bank of Garrison Creek. This fort was destroyed in the Battle of York, 1813 (see below). Today's Fort York was largely built by Royal Engineers immediately after the War of 1812. 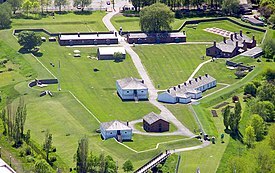 The rebuilt Fort York is located on the original fort site west of Bathurst, at the time on the west bank of Garrison Creek. Fort York's buildings are among the oldest buildings in Toronto today. The original fort buildings were all wood, whereas the current structures are a mix of brick and wood. A cannon emplacement at the northwest corner of the Fort. Cannons can be found throughout Fort York. There are two bridges located at Fort York. Garrison Crossing (formerly Fort York Pedestrian and Cycle Bridge) is a two span pedestrian and bicycle bridge being built to connect Fort York with Stanley Park. Completion of the bridge was planned for 2017 and is now slated for completion in fall of 2018. It will be built with stainless steel by Dufferin Construction Company. This bridge replaced the Garrison Road Bridge, which carries vehicular traffic under the Gardiner Expressway to Fleet Street. The second bridge is a small footbridge from Bathurst Street which is off limits, and protected by an iron gate. Southwest of the Fort is Fort York Armoury, a facility used by the Canadian Forces. Southwest of Fort York is the Fort York Armoury, a two-storey structure built in 1933 with private funds. Designed by Toronto architects Marani, Lawson and Morris, it has the largest lattice wood arched roof in Canada. It is occupied by the Canadian Forces Primary Reserve, the Queen's York Rangers, the Royal Regiment of Canada, and the 32 Signals Regiment (formerly 709 (Toronto) Communication Regiment). It used to be the home of 2 Field Engineer Regiment, the Toronto Scottish Regiment (Queen Elizabeth the Queen Mother's Own), the 48th Highlanders of Canada, and the 1st Battalion Irish Regiment. In addition to being the headquarters of the three active units of the Army Reserve, the armoury is also home to several thriving cadet organizations. Fort York military burial ground is a part of Fort York National Historic Site. The Fort York National Historic Site was established on 25 May 1923, and houses Canada's largest collection of original War of 1812 period buildings. The bulk of its property consists of the area around the old fort. The National Historic Site includes a parcel of land east of Bathurst Street, as well as St. John's Square / Victoria Memorial Square to the northeast. It operates as a museum of the City of Toronto, offering visitors a number of services year round. The fort's first cemetery at St. John's Square / Victoria Memorial Square is also part of the NHS. The second cemetery for the fort is also located in the Garrison Common section of the site. By the late 19th century twenty eight stones or wooden crosses marked graves, but there were hundreds of mounds. Headstones were later assembled into a memorial wall. Each April, the site commemorates the US invasion of April 27, 1813, with walking tours, artillery and musket demonstrations, period cooking, and groups portraying units involved in the battle. During the summer months, the site comes alive with the colour and pageantry of the Fort York Guard, and is complimented with tours by professional historical interpreters. In the off-season, the fort is provides educational programs for tour groups including school, scout, guide, and day care groups. The Fort York Museum is affiliated with: the Canadian Museums Association, the Canadian Heritage Information Network, and Virtual Museum of Canada. The Fort York National Historic Site and Garrison Common receives community support through two registered charities: the Friends of Fort York and Garrison Common, and the Fort York Foundation. ^ Fort Yprk National Historic Site of Canada. Canadian Register of Historic Places. Retrieved 7 May 2014. ^ Fort York Heritage Conservation District. Canadian Register of Historic Places. Retrieved 7 May 2014. ^ "Major construction on Fort York pedestrian bridge gets underway". CBC News. July 27, 2018. Retrieved 2018-09-05. ^ Fox, Chris (24 November 2015). "City unveils designs for $19.7 million Fort York pedestrian bridge". ^ "Construction begins on pedestrian crossing bridge near Fort York". Global News. Retrieved 2018-09-05. ^ "Made of stainless steel: Fort York bridge first of its kind in Canada". 24 November 2015. Wikimedia Commons has media related to Fort York.